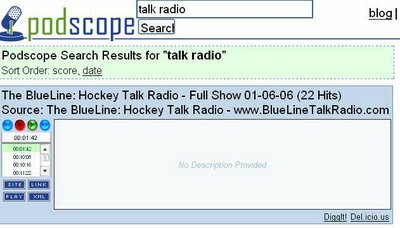 Podscope lets you search for a word or phrase that is spoken inside an audio or video podcast and lists the number of occurrences of the search terms in the podcast. The neat thing is that you can listen to snippets of the podcast that contain the search term you're looking for to see if you want to listen to the whole thing. While the search could be improved substantially, it is surprisingly effective and is a good way to weed through the mass of podcasts out there. 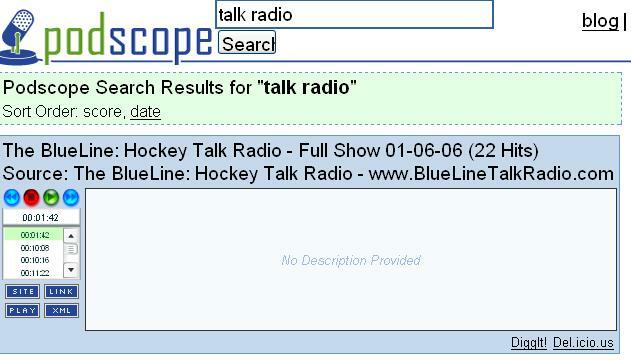 For podcasters, Podscope Remote offers a search box that you can put on your site. Just enter the URL of your feed and copy and paste the code that you get onto your page.